Master Wing Chun, Become More Deadly, Learn Faster, and Win! 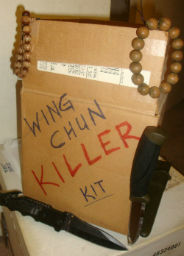 It's Rob from WingChunLife.com and I'm always looking for an edge to sharpen my training faster and deeper. You're probably the same, so I have something valuable to share with you. I was recently reading a copy fo NLP: The Essential Guide to Neuro-Linguistic Programming an in Chapter 3: Living in the Zone, it gave the mental process the U.S. Navy SEALs use to get through and survive Hell Week; and succeed in life and death missions. You and I can both learn to adopt their methods and apply it to our Wing Chun training, and to other parts of our personal and business life. SEAL training was modeled after the British Special Air Services commandos. But SEALs have a few customizations since they spend so much time cold and wet. In order to get chosen just to try out, you have to be the best of the best in terms of IQ and physical fitness. In other words, only the best get a shot at becoming a SEAL. The first thing the navy does is weed out the top candidates during a 6-week sifting period that ends with Hell Week. During Hell Week, candidates spend nearly all their time cold and wet. And during a 60-hour period, they only get 4 hours of sleep. It's a tough environment to succeed in. The problem is that nearly 76% of these top-tier, best of the best, candidates quit during the sifting period. The navy believed all these candidates had the physical ability to do what was asked of them, but dropped out for other reasons... how they used (misused) their mind. Losing so many elite candidates was expensive. So the navy hired a psychologist to find the difference between the quitters and the succeeders. And then teach what the succeeders did to everyone else. It worked. Graduation rates jumped 50%! Don't worry about 'long-term' goal setting. Instead, focus on the job right in front of you, and get it done. Don't think about what happens next, don't think about what you're going to have for dinner later. Narrow your focus on what's in front of you and nothing else. "The major way to combat stress when you're doing something very difficult is to narrow your focus. Remember any and all of your past successes in life, in business, in your training, with your family. Use any success you can find, no matter how small you think it is. These experiences become your ammunition. Remember how you felt with each of these successes and feel them again. Let each one build up inside of you and join all these feelings together as one. Remember and imbed these feelings into your muscle memory. Then transfer these feelings into what you are doing now. "Tell yourself how good it feels to be making progress, how good it feels to be almost done, how good it feels to be completing this task." You can break the task into smaller pieces and make each step feel great. When you're doing something challenging and difficult it's normal to feel panic, discouraged, unmotivated, drained, etc. This is a natural reaction by your brain. When you're failing, your brain goes into automatic survival - flight - mode. You beat it by changing your blood chemistry by flooding it with oxygen. This settles down your panic reaction, which is controlled by a part of the brain called the amygdala. Physiologically you lower your blood pressure and flood your brain with oxygen, which improves your ability to think and react thoughtfully (without panic, without locking up, or becoming stiff). The SEALs are taught to drown out negative, discouraging, and critical self-talk. They mentally teach candidates to say (in their heads), "You can do it, this is easy, forget that last mistake, focus on the next shot and getting it better." Candidates mentally cheer themselves on while doing it, while they're in it. Instead of listing their troubles and everything that's holding them back, they instead list out everything that is great and that feels good. "This has nothing to do with being reasonable; this is about being successful." Remember, these are the methods used by people succeeding in the some of the harshest environments in the world. It works. Use these mental habits to help you succeed at the kwoon, at work, at school, and in your daily life. Make them second nature by practicing and using them often. Especially when you start to feel anxious or panicked about a situation. Cheer yourself on. Tell yourself mentally about all the things that feel good while you're doing it. If you want to learn more about using your head right, to excel at Wing Chun or any other areas of your life, check out NLP: The Essential Guide to Neuro-Linguistic Programming on Amazon. P.S. Tuesday night, December 16 is the last time you can save 15% or more on Wing Chun gear like weapons, dummies, wall bags, books, and DVDs at Everything Wing Chun. Use coupon code: Dec2014. Pay them a visit, you might find something you need. Click here.